With reboots being all the rage right now, it’s rare you come across one that may just open your heart a tiny bit more than the original did. 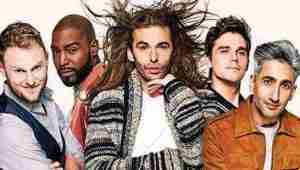 With Netflix’s reboot of Queer Eye, they seem to have achieved both. The location has changed (New York has been traded for Atlanta) as well as the cast. 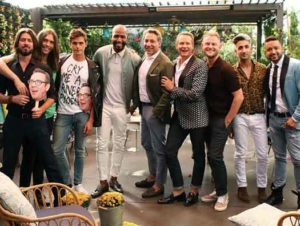 Bobby Berk is on hand for design, Antoni Porowski is on food and wine, Karamo Brown helps out with culture, Jonathan Van Ness is on hand for grooming needs, and Tan France is the fashion guru this time around. 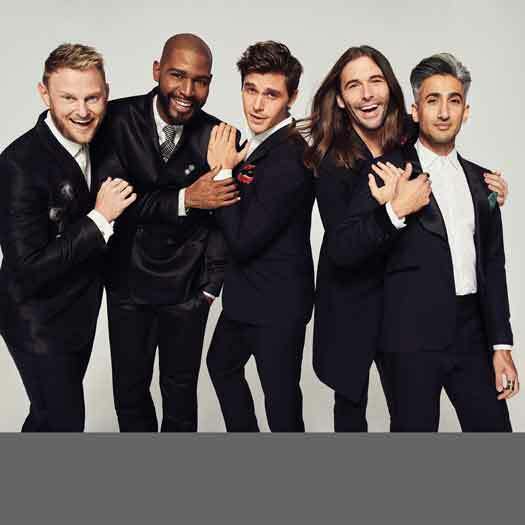 I sat down with the whole cast for a Queer Eye interview to talk about what it’s like taking over the Queer Eye mantle and how they hope to change the world with the new format. What is it like entering into a legacy like Queer Eye and not only making it your own, but remaining true to the original show? Karamo: It is exceptional to step into the shoes of these five men, do it our own way and pave our own path. I am really proud of the way the world is responding to it because we ourselves are so proud of it. Jonathan: I would say that the reaction has been so positive that I cannot say I would have gotten this far without the wonderful gift of disassociation. Stepping into these shoes and wanting to go a good job — these are some big shoes to fill — so there was some pressure and some nerves. I think she is being well received! Antoni: I have to say, my anxiety was lessened and went down a bit after the love and support that we have gotten from the Queer Eye “OG’s.” They have been nothing but positive and supportive throughout this whole journey. A lot of us are in touch with them and we could not be more excited. With some of your subjects, their individual stories are almost like their own individual flower that blooms throughout the episode. The audience is going to inevitably fall in love with the subjects, but is it hard for you boys to not fall in love with them as well? Tan: Actually, it is really hard to not fall in love with them. For me in particular, it was actually impossible. I know that’s the case with the rest of the cast as well. I don’t know if you noticed, but in the original version of Queer Eye, they only spent one day with the subject. They called it “One Gay Day.” However, we spend one whole week with them. We really work on making every aspect of their life great. We become very close with them during that week. By that Friday, when it’s time to say goodbye, it’s very hard for all of us. They’re crying, and then when we get into the trailers, we’re crying. We have gone through such a profound experience with them. For most of these men, this is a truly life changing experience. We know this because with the power of social media, we are able to stay in touch with them, even though we finished filming months ago. It is an amazing feeling knowing that we were able to make such an impact on people. Truly, it’s not just a show. You are filming in a very conservative area, and you are five beautifully diverse gay men. Was there any apprehension filming in such a place this time around? Bobby: Oh, absolutely. I grew up in the Midwest, and I was kind of scared at what we could possibly run into. I grew up in a super-religious family and area. That is also why I ran away at 15 years old; I got the hell out because of what I had to go through just to be gay. We all had a lot of apprehension, but we all know the things that make us different. We went in to find the things that make us the same. For example, on the episode where Cory was our subject, his yard was filled with Trump/Pence signs and it was almost like we were at the wrong house. At the end of the day though, Karamo talks to Cory on an almost daily basis now, and I talk to him once every couple weeks myself. Our apprehensions were eased because we got to meet such amazing people that we thought were going to be so different from us, but they really were so much the same. Karamo: I think this is what will be the beauty of the show, and we are already starting to see it. People are learning a way you can have these conversations with people that are so different from you, and we have all gotten to do that now. That “Make America Great Again” hat was going to burst into flames! Karamo, in the episode with Cory you actually donned a “Make America Great Again” hat for a brief moment! I thought it was going to burst into flames! Karamo: (Laughs.) I thought I was going to turn into Omarosa! So many issues are brought out on the show. From police brutality to politics, you guys are reaching across the aisle and talking about serious issues with people that may not agree with you. Are each of you socially conscious in your own life, and was that able to be brought into the show? Karamo: Yes. The thing that the producers allowed us to do was to bring all of our identities into filming. At no time did they ever tell us to just be gay men. They wanted us to be gay, black, a father and be who we are, each of us. That is why you are seeing these politically and culturally relevant conversations, because we can bring all sides of ourselves to the table. Jonathan: Absolutely. I mean, did I realize that being a part of Queer Eye, I would be talking about the militarization of the police force? No. Do I feel strongly about it? Yes. In the podcast I do, Gay Of Thrones. I tackle things I may be generally curious about, or want to learn about. And I got to bring that all into shooting. It was a good lesson because you can connect with people, even though you may not want to ever know who or what they voted for. You can still connect with them. Tan: The luxury of being on a platform like Netflix is that we have the freedom to be able to talk about whatever we want. We can articulate the feelings we have any way we like. Something that the producers and creators did a great job on was that while the format is the same, we don’t shy away from any conversation that we want to have at any point. There were no restrictions on our conversations. We are not trying to make this a political show, but by the nature of who we are, there is going to be political content. I think it’s important that there is a space for it. Antoni: The differences don’t always lie with the five of us, and the people we are helping, either. Amongst us, there are differences. I mean, with the episode with AJ that deals with coming out, we hear my version, and then the other guys’ stories, and in a sense they are unique, and in a sense they are not. We all have the same emotions and feelings, even though our stories are so different. What is the legacy of Queer Eye? What do you want the legacy of your part of this show to be? Tan: For me, I want it to go beyond the borders of the United States, and I think we will. I respect so much what the original did for the United States and for Westerners. As a Middle Eastern person, I am really excited to see us encourage and persuade the rest of the world to treat queer men and women with respect and as equals. It is time to make that a more global issue. You are going to inspire an entire generation of people behind you. What do you do to stay inspired in a world that can be very tough? Bobby: I stay inspired by seeing how far we have come. Little gay Bobby in Missouri: you are in for a lot. We still have so far to come, and so many kids are afraid to come out all over the world. When I walk down the street and see little 10- and 12-year-old little boys being loud and proud. That’s how I stay inspired. Karamo: I stay inspired by knowing there is still an opportunity for people who thought they had nothing in common to connect. It shows that one conversation at a time, one connection at a time, our world can get better. Antoni: For me, just going forward, not just for the show, but in life as well, is inspiring. Whenever I am fearful or hesitant in dealing with someone who is very different from me, by leaning into that and finding out more about the person, I find we share the same feelings and the same anxieties. They may be expressed in very different ways. The direction may be different, but at the end of the day, there is so much similarity between all of us.